Eleagnus pungens, or Fruitland silverberry, is a dense, medium-sized evergreen shrub that can quickly fill out a 6- to 10-foot space. However, it’s often pruned to keep a smaller size or hedge. The olive colored leaves are oval in shape and often accented with silvery scales on the upper sides. Brown scales on the undersides of leaves often cause concern for homeowners, but it’s a natural element of the foliage. In late-summer and fall, plants produce clusters of fragrant white flowers, followed by reddish-brown fruit in winter. Birds often forage on the fruit. If you’re looking to create a small yet dense urban privacy screen, this is the perfect plant. Easy to grow and maintain in sunny to part shade conditions. 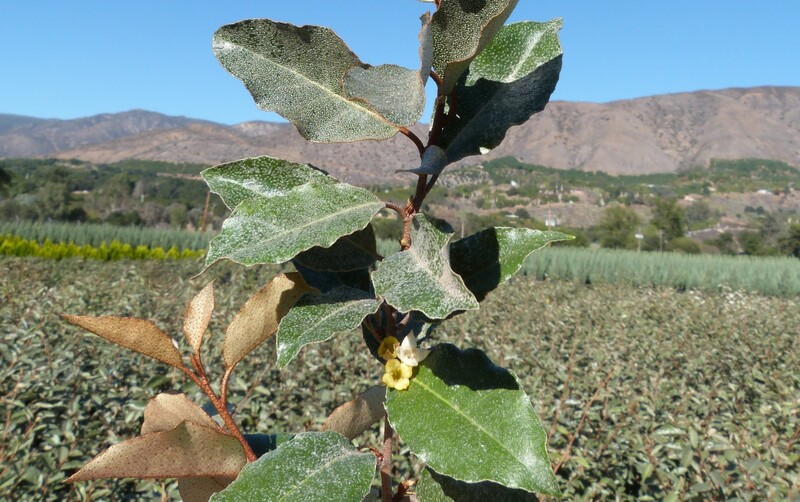 Fruitland silverberry tolerates a variety of growing conditions, including wind, poor soils, heat and cold snaps.